This is the crude, weak “resin sample” of my custom device. It was way off, but was so weak that it broke before I could even try it on. I just completed ten days wearing a Custom Chastity Ghost chastity device. I reviewed in a prior post. Once I put in several hours sanding the roughly-finished device, I was locked into it. The device was extremely comfortable throughout the test period. Last week, Mrs. Lion decided to put me back in the Mature Metal Jailbird. This is the device I have been wearing for almost four years without a single problem. I inspected the Ghost after it was removed. To my surprise, the back of the base ring (the part that touches my abdomen) had a really bad smell. It wasn’t a urine smell. It was a new one to me. I have years of experience staying clean while wearing a chastity device. In the shower I always soap the device, including the back of the base ring. I rinse with a shower massager that does a great job rinsing me off. Over time, some body oil and proteins will get on the device and won’t wash off in the shower. My Jail Bird never picked up a bad scent. The finish just got a bit dull. That’s why I bought an ultrasonic cleaner. I started thinking about why the Ghost would smell bad. The only cause would be bacteria. Then I remembered that the device is 3D-printed. A 3D printer is a three-dimensional dot matrix printer. It deposits little droplets of plastic as the printing head travels across it’s path. When it finishes printing a layer, the head moves up and it prints the next. So far so good. If you look under a magnifier at a color picture in a magazine, you will see lots of cyan, magenta, yellow, and black dots. The colors look solid when you take the magnifier away. Well, the 3D printer does the same thing. What it prints isn’t really solid. It is very porous with voids between the 3D dots deposited by the printer. An object cast with a mold will be much heavier than the same device printed by a 3D printer. The couple that own Custom Chastity like to claim the nylon used in their cages is the same material used for medical devices. They may be right. But medical devices are solid-cast in nylon. Yes, you hear of devices that are 3D printed. The printer makes a model of the final device. Then the device model is carefully polished. All 3D -printed objects have a rough, sandpaper-like finish when they come out of the printer. Once the device is sanded and polished, it is used to cast a mold. The final product is solid nylon that was cast in the mold. 3D-printed devices are much weaker than cast ones. I overlooked all this when I did my first review. Ok, fair enough. I figured that the design of the Ghost took into account the loss of strength of 3D-printed objects. They did. The chastity device is strong enough for its intended purpose. What I didn’t consider is that those little pores in the device could be a problem. My theory is that my body oils, sloughed skin cells, and other proteins found their way into those pores in the base ring. Bacterial came along too. The bacteria reproduced in the lion soup I provided. Voila! Stinky base ring. Normal washing with soap and water in my shower couldn’t clean those millions of pores. Only my ultrasonic cleaner with a special ultrasonic cleaning detergent could get rid of it. Yuck! Another demerit for Custom Chastity is the price. A custom-printed Ghost costs $250USD plus shipping. Custom Chastity, modifies their standard design for the device to match your measurements and then uploads the design to a public 3D printing company. When they get the device back from the printer, they put it in a cheap, blue plastic zipper bag along with a decent padlock, a couple of numbered seals, and a sample of silicone lube. They then ship it off at your expense. Oh yes, they provide a “resin” sample to give you an idea of the size. That sample is produced on their inexpensive home 3D printer. The one they sent me was dreadful. It broke before I could even try it on. Based on my research, it costs about $50 USD, tops, to print the device. The lock probably costs another $5 USD. So they make almost $200 for their trouble. That’s a very unfair profit, especially since the device is so flawed. You could argue it took them a couple of hours to modify the design for your custom cage. Ok. I invested three hours sanding it so it would be wearable. All that notwithstanding, it turns out that the porous nylon the device is made from can easily become a petri dish breeding bacterial despite efforts to keep the device clean. 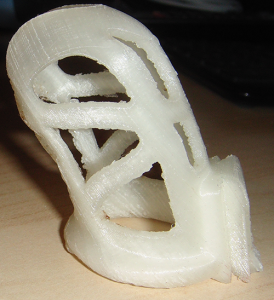 I think the future of right-out-of-the-3D-printer chastity devices is not very good. If someone would use the printed device as a matrix to build a mold and then pour the nylon, that would be perfect. But that would require work to finish the printed device, make a mold, and cast it. I would pay $400 for a device created that way. As it stands, I can’t recommend the products from Custom Chastity. There are just too many reasons to avoid them. Save your money and get a steel, or cast plastic device. Your reviews of this device are very complete. Thank you! Not all 3d printing is skive the same way. Some use a continuous stream of molten plastic that could cause boss like you describe in between layers. Other methods are using a laser to fuse together micron thick layers of plastic dust. A search for shapeways 3d printing will show how this is done. You can see the “pores”. Shapeways is far from solid plastic. Trying to fuse the outside still isn’t perfect, unfortunately. It’s been my experience that any plastic device – even injection-molded ones like the CBx000-series – are difficult to keep clean and will acquire an odor after a while. Metal (stainless-steel, or titanium) does not have this problem. It is possible to 3D-print metal, and unlike common desktop plastic printers, it is also possible to avoid the porosity problem. One metal printing technique is laser-sintering, which melts together very fine grains of the source metal into the desired shape. This process is very controllable; it can be used to make metallic filters (very porous), but with longer melt times the end product can be made completely gas-tight. The printed finish is still dull (not abrasive, but rough), so quite a bit of polishing is required, but the device itself is non-porous. Th CBn devices are tubes and hold a urine odor. This is a cage so no urine smell. This was different.